(CNN) - Florida Gov. Charlie Crist has decided to run as an independent rather than compete for the Republican Party nomination in his bid for the Senate, multiple sources tell CNN. One of the sources, a fundraiser, who spoke on the condition of anonymity, said that Crist has begun contacting financial supporters to tell them that he is running as a non-party affiliated candidate and to ask for their continued support. Once the overwhelming favorite in the battle for the Republican Senate nomination, Crist is now trailing former Florida House Speaker Marco Rubio by more than 20 points, according to a Quinnipiac University poll released earlier this month. But the survey offered hope Crist could win in November if he ran as an independent. In this scenario, Crist would have a slight edge over Rubio and a larger lead over Rep. Kendrick Meek, the likely Democratic nominee, in a three-way general election match up. Crist is expected to officially declare his intentions during an event Thursday afternoon in his hometown of St. Petersburg. 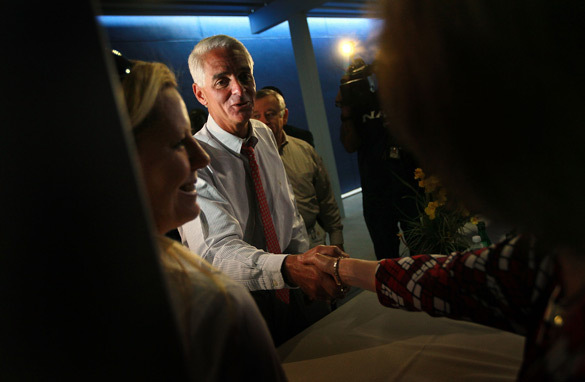 Crist's campaign is calling it "a candidate qualifying event." Crist has until Friday to declare his intentions. If Crist does decide to launch an independent bid, a source tells CNN that one of his main GOP consultants, Public Opinion Strategies, will leave the campaign. I guess he didn't pass the purity test. It is good he got out now before they came knocking on his front door asking to collect a sample. Good luck Gov. Christ. Wish you the best of luck and thank you for choosing to be INDEPENDENT. Just goes to show that our two party system FAILS yet again. By the way I want to give a shout out to Mr. Steel for doing such a wonderful job as head of the Republican Party. Keep up the good work so we can get more people like Gov. Christ. I kinda feel bad for Kendrick Meeks. It seems that all the excitement is around Crist. I say Go Krist GO! Good riddance Charlie, you loser. Out with the RINOs and in with the conservatives. Might as well just join the Democrats like Arlene did while he's at it. The GOP has lot all respect by sensible moderates. The GOP is bent on an extreme right-wing fascist agenda – that aims to drive anyone that opposes their Tea Klux Klan militant agenda out of the party. McCain and Crist could have been President and Vice President to say the least. What would have happened would they impeached by the tea party. You guys love to take shots and we are tired of it. For too long Dems kept quiet while the likes of palin, rush and sean demonized the President. It's over, all gloves are off. Thanks for making us realize how REPUBLICANS HATE AMERICA. We will see you in November and we'll be there to see you cry in December. Then, we start this all over. Until 2012, you'll cry in 2013. This is the new America folks, get over it or GET OUT! Spoken like a true Liberal fascist! Looked like fact based criticism to me....but of course they are all racists right, how dare they? Gee Charlie, you are finally showing your true colors. Why don't you go all of the way and COME OUT OF THE CLOSET. Crist has sealed his fate. He is not going anywhere. The country is realizing what we in Florida have known all along. Crist is a RINO. Tis is his last stand while we watch him fall. The GOP will have nothing for this guy from this point on – Thank God! Good for you, Crist! Even better for Dems!